Database Systems Corp. (DSC) is a proven leader in the call center industry providing technology products and outsourcing services since 1978. DSC supplies call center phone systems and software that automatically call households and businesses delivering marketing and sales information. DSC also offers direct marketing services using our call centers located in multiple locations. Besides offering voice broadcasting systems and services, DSC provides a comprehensive contact center software suite of products. Our direct marketing software includes CRM and customer data management software as well as computer telephony integration systems. These products help your marketers communicate effectively with your clients and prospects. A further definition - Advertising that involves a "direct response" (which is an equivalent term) from a consumer - for instance an order form or coupon in a book-review section or in the back of a book, or mailings (direct-mail advertising) to a group presumed to hold a special interest in a particular book." Our direct marketing phone is designed to operate in conjunction with our award winning call center software to provide your organization with the most modern technology available. 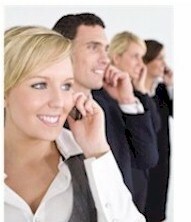 These phone systems support both inbound call answering programs as well as outbound direct marketing dialing campaigns. Contact DSC to learn more about our direct marketing products and services. Contact DSC for a FREE analysis and quote and to learn more about our direct marketing products and services.